Photos by Ying Chia Huang. This Sunday, April 14, 3013, marks the seventh concert of Le Salon de Musiques’ 3rd season. It’s impossible not to smile when soaking up the glorious music emanating from a handful of accomplished musicians, playing a mere few feet away. You smile when Phillip Levy on Violin, plays a particularly sweet note. You marvel at Rina Dokshistky’s fluid expertise on Piano. Best of all, you smile as you share the glances the musicians shoot at one another from time to time, checking in with each other for cues and momentum. 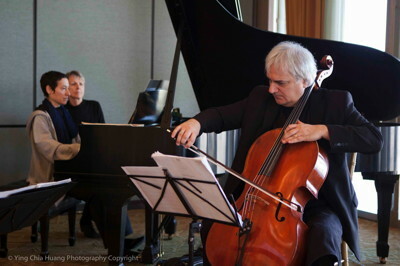 Alongside these two mentioned, Andrew Shulman also performed on Cello. 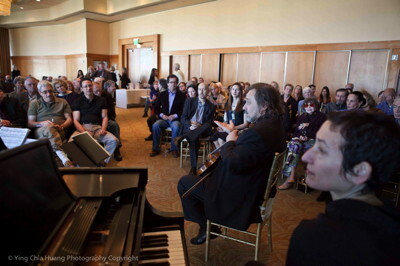 The sixth concert of Le Salon de Musiques’ 3rd season, was held this past Sunday, on March 10, 3013. The concert featured Ravel’s Piano Trio in A minor, Debussy’s Cello Sonata in D minor and Violin Sonata in G minor. Chouchan also whetted our appetite for next month’s concert, excitedly revealing that we were to hear a Cello Sonata that was a “very important and amazing Camillo Schumann work that is unique, romantic and not very well known.” In fact, this piece is making its US premier performance at Le Salon, on April 14. “It took me six months, with the help of the German Consulate, to locate the score,” Chouchan added. Le Salon de Musiques graciously thanks the French, Polish and German Consulates for their ongoing support and sponsorship. As always, musicologist Julius Reder Carlson intelligently introduced the concert. No matter how knowledgeable you may already be about classical music, in general, and Debussy or Ravel, in particular, you will learn some fascinating facts about the selected composers and the era in which they lived and worked. The first piece performed was Debussy’s Cello Sonata in D minor, played with great enthusiasm and dramatic flourish by Andrew Shulman on Cello, accompanied by Dokshistky on Piano. What a character! At times Shulman, with his shock of silver hair, huffed and almost snorted like a bull facing a toreador in the ring. 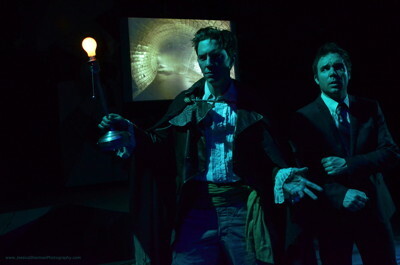 He raised his eyebrows at some amusing moments, sharing the musical ‘joke’ with us, his enraptured audience. For Debussy’s Violin Sonata in G minor, Phillip Levy on Violin, again accompanied by Dokshistky on Piano, was equally entertaining but in a different way. 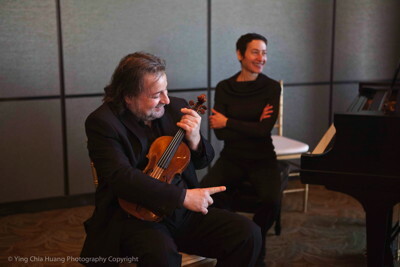 In an unusual prelude, Levy took a few minutes to preface his performance with a brief lecture, performing snippets of the piece we were about to hear and describing what he imagines when he is playing. The bow scratching on the strings, he explained, reminded him of a dog scratching at fleas. This mini-preamble was delightful, playful and had us all giggling like school children. As always, after the delightful music had ended, there was ‘La Conversation’: bubbly glasses of French Champagne were enjoyed during the informal Q & A session between the audience and the musicians. As usual, a buffet of sandwiches and petit fours followed the lively discussion. There are ONLY TWO remaining Le Salon de Musiques concerts this year – do not miss them! The seventh concert of Le Salon de Musiques’ 3rd season. The eighth concert of Le Salon de Musiques’ 3rd season.